Hello everyone!! Today I have another fun mini album to share with you!! I used the brand new Simple Stories Say Cheese 4 collection for this mini. It measures 7” by 10” with a 2.75” spine. I wanted this mini album to be fairly large so it can store TONS of photos!! I did use a hinge binding system with pocket pages. You can find a tutorial HERE from My Sister’s Scrapper. All you have to do is adjust the measurements to your liking. Christmas has come and gone…and the New Year has just begun. Valentine’s Day is just around the corner!! I have a fun and super quick project to share with you using the Simple Stories Kissing Booth Collection to help you get those Valentine’s treat boxes ready!!! The first little box I want to share with you is this adorable 3×3 treat box with a built in card!! You can find the tutorial for this cutie over at My Sister’s Scrapper YouTube Channel. This little box is so incredibly easy and is perfect to store those little treats!! Great for those classroom Valentine’s!! After creating this box I wanted something smaller that I could fit a giftcard inside…so I did some measurement testing and came up with this little holder. It’s the exact same thing as the treat box above but measures 2.5” x 3.5”. For the box you will need a piece of cardstock measuring 3.5” x 9”. Score at 2.5”, 3”, 5.5”, 6” and 8.5”. To create the drawer you will need a piece of cardstock measuring 3 3/8” x 4.5”. Score at ½” on all four sides. Use the tutorial linked above to assemble the box. Tada!! I hope you enjoy this fun little project to help you with those Valentine’s!!! I am super excited to share this vintage inspired mini album using the gorgeous Simple Stories “Simple Vintage Christmas” collection!! I absolutely LOVE this paper collection!!! It reminds me of my Grandmother and all the Christmas fun when I was little. If you are local to the Phoenix area you can find this album along with the entire collection at Scraps of Love in Peoria and Sun City West!! Get it while it lasts!!!! This album is a simple pocket page constructed album consisting of only four pages and measuring at 6” by 7.75”. With a 2.5” spine, each page has a half inch gusset to allow plenty of room for the layered chipboard frames. These frames are simply gorgeous and made this album so easy to decorate. You can find an easy step by step tutorial on how to construct this album over on My Sister’s Scrapper YouTube channel. Like I said before, these layered frames are gorgeous, and I didn’t need to do much to decorate my album. I did layer some stickers, bits and pieces, and some chipboard elements to each of them for some dimension. For some added interest I did make one of my pages super big to allow my photo mat insert stick out quite a ways. I hope you have enjoyed this mini album and are inspired to make a fun Christmas album for yourself!! Hello everyone!!!! 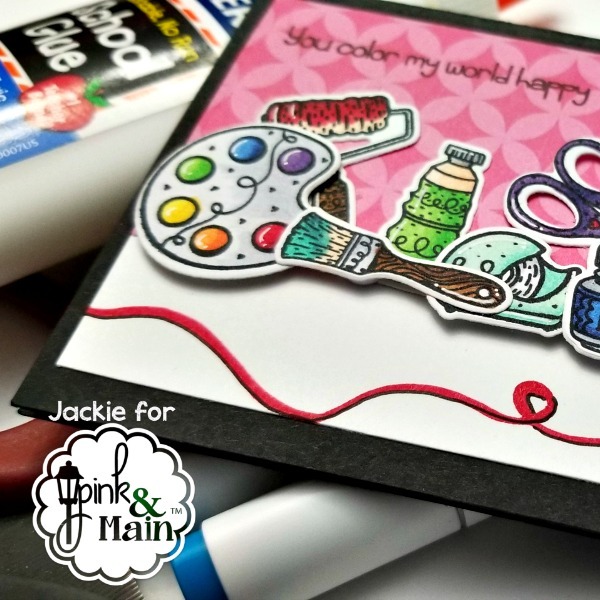 Today I am sharing the new “Crafty” set from Pink and Main It’s super fun and perfect to create cards for your fellow craft mates!! I kept this card super simple and allowed the images do all the work for me!! Using only white and black cardstock and a scrap piece of Beach Babe patterned paper. 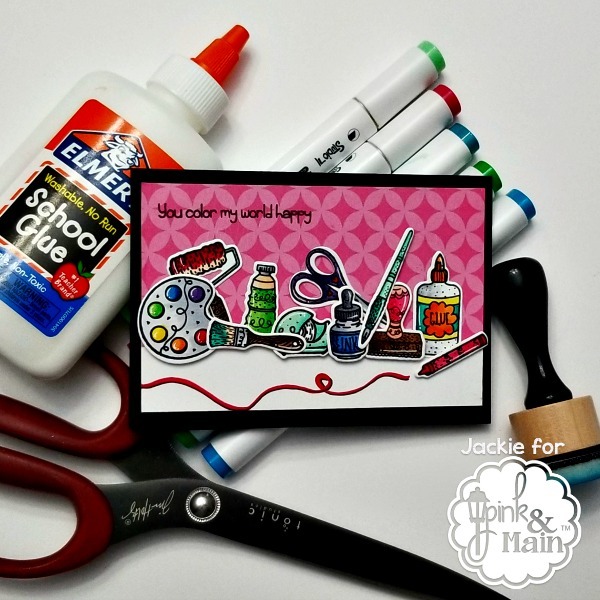 I wanted my card to be super colorful and the feeling someone just grabbed a ton of supplies and spread it out on a table. For some extra interest I took my red Copic marker to add a squiggly color line on the bottom of my card. I hope you have enjoyed this fun and simple card!!! Craftin Desert Divas October Release Sneak Peek!!! It’s that time!!! The Craftin Desert Diva’s October release is just days away so it’s time to share some sneak peeks with you!!! This release is super awesome and you aren’t going to want to miss out!! Today I am sharing the fun “Christmas Cheer Trolls” stamp set with you!! 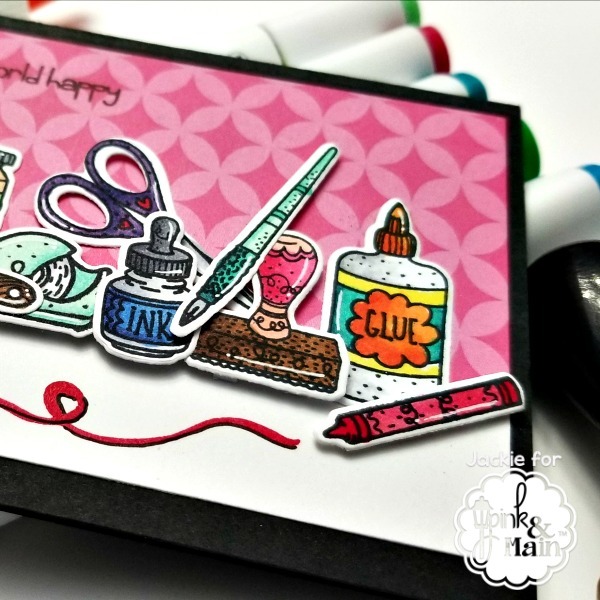 You can also see a quick coloring video using this stamp set HERE!!! Enjoy! !